Wowsa. Look at this beauty! 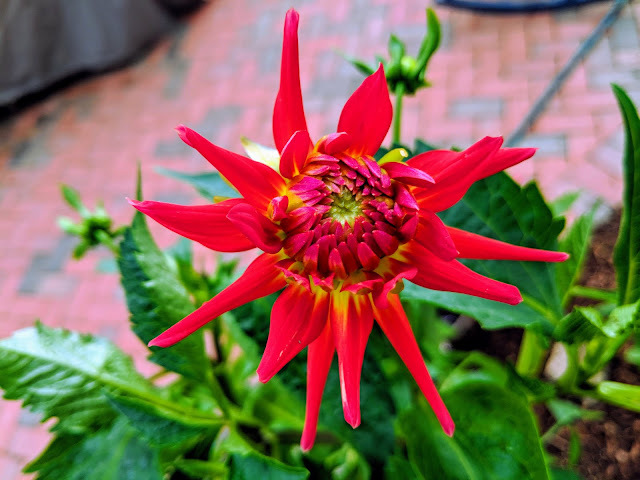 This is the Vuurvogel Firebird Semi Cactus Dahlia that I planted (indoors at first) all the way back in March. This bloom, on the very top, is the biggest and most advanced, but there are a handful of others that are following closely behind. I've kept the pot watered consistently and spent more than a week hardening this off by putting it outside for a few hours during the day and increasing the time outside over the course of two weeks until I finally left it out overnight. The only concern that I have now is that I might have planted these in too small of a pot. Nat pointed out recently that as the dahlias have grown, they've consumed most of the space. And, add to the fact that I planted an elephant ear in the same pot, it all means that there's space issue. The elephant ear is slowly growing up, but I have to think the dahlia is starving it for air/space/food/water. I haven't tried (yet!) to pull, dry and store tubers over the winter, but the way this one has grown makes me consider giving it a try.